It's time to check out Stoner Joe's Crunchy Chronic Cannabis Kernels, rushed overnight from the Denver TJ's. Just kidding. They're broccoli florets. Not quite as creative as "Inner Peas" or anything like that, but I suppose "broccoli" doesn't lend itself to that kind of play on words. I racked my brain for something to prove I'm nearly as creative as TJ's marketing department, Russ, and reader **Tammy**, but all I could come up with is a new kale product that might have Caesar dressing instead of zesty nacho, which of course would be called "Kale, Caesar!" Which conveniently brings me to my first actually-relevant point about the product itself—taste and texture-wise, these aren't all that dissimilar from the aforementioned kale chips, the biggest difference being the lack of a "dressing" type flavor in these broccoli florets. And if you go back to that kale chip review, you'll find that it's a highly polarizing, love-it-or-hate-it product. The comment section reads like a death threat followed by a love letter followed by a death threat, and so on. So my advice to you now is, if you hated the kale chips, you're probably gonna hate these bad boys and should consider avoiding them. You may still issue death threats via the comments section if you feel they're warranted. Love letters are also appreciated, but do note that I am happily married. I thoroughly enjoyed the kale chips. And I'm enjoying these happy broccoli bites. I do wish that they had some kind of dressing, as well, though. They're weird, brittle, and crumby. 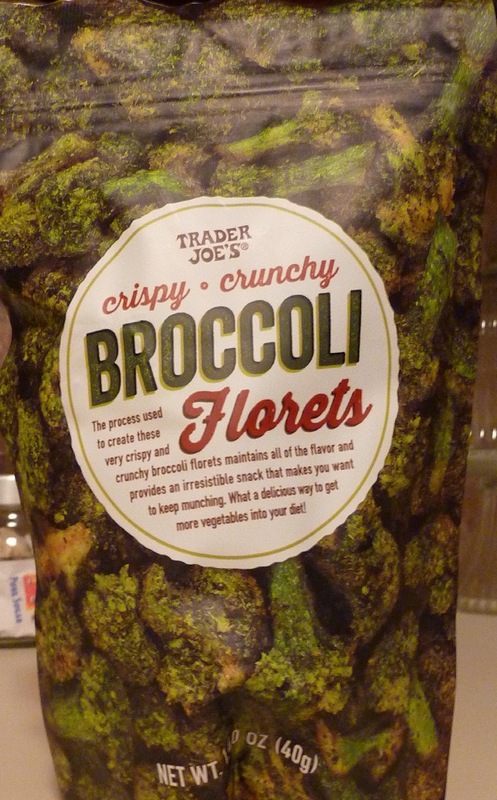 They're also "planty," but they really don't taste or feel like broccoli to me, except for maybe the aftertaste. They're salty, and there's almost a nutty quality about them. They're surprisingly fattening for broccoli, which I guess can be attributed to the presence of palm oil. They're chock full of dietary fiber and vitamin C, so I think we can still declare them "healthy-ish." At $2.79, we're looking at a significantly lower price point than the kale chips. Plus the florets are filling and satisfying, so I'd call them a success in the "value" department. On the flip side, I'm dubious to declare that they could ever be a staple in our household or a regular TJ's purchase. So I think a 3.5 is an appropriate score. 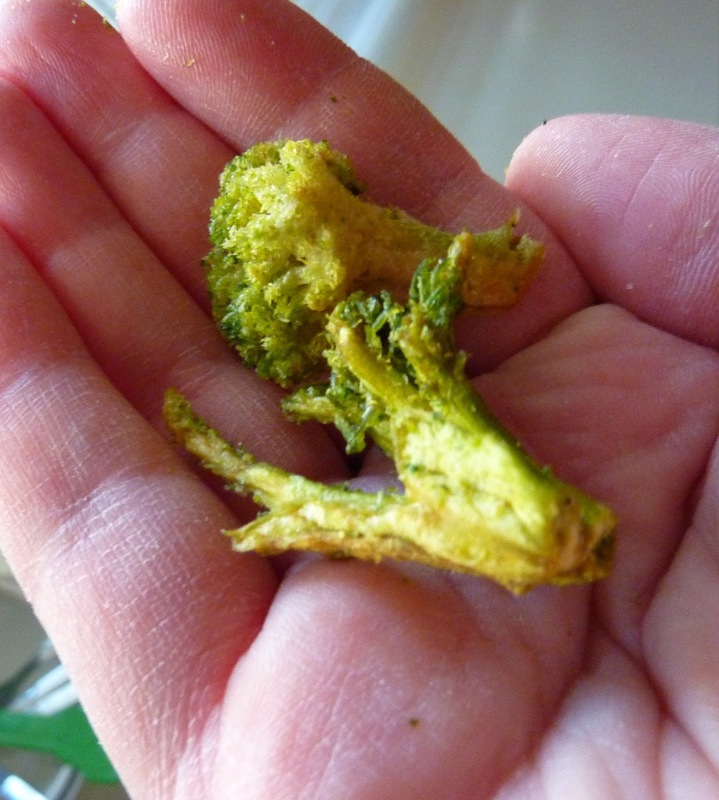 If you liked the kale chips and the idea of dried, crunchy broccoli doesn't turn your stomach, I say give 'em a whirl. Sonia echoes my sentiments with a matching 3.5. I was all in until I read the fat count. geez louise! They truly tasted the way fish food smells. Pass! I just tried these recently and think it's a great way to get your veggies. I liked them. Tried them today. 1st taste was odd, after that they seemed good, but excessively oily. Interesting that the entire bag is considered 1 serving - it will likely be 3 for me.